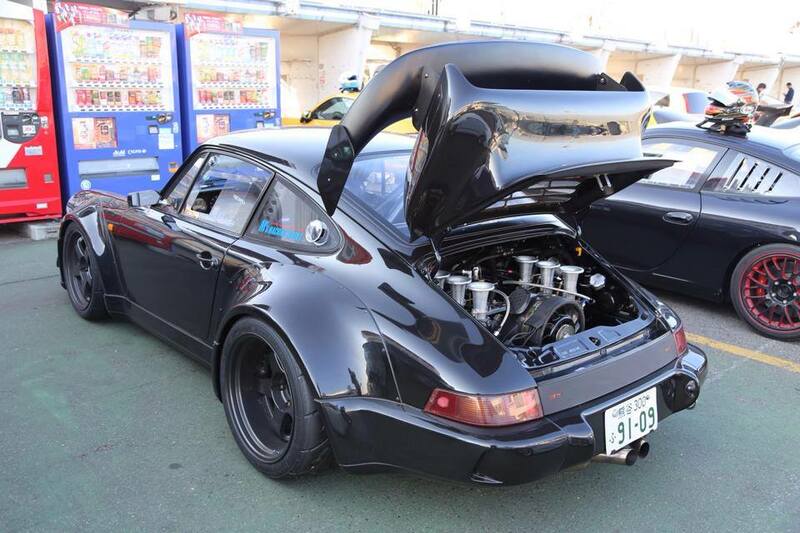 This is unquestionably not only one of the nicest 964s I’ve seen, but one of the coolest modified cars, period. There is an old expression in the sports car world “handles like it’s on rails”. In other words, a car that changes direction with such eagerness, authority, and minimal loss of energy, that its akin to a train following a track. To this end, people often go about fitting the stiffest springs they can, with the biggest possible swaybars, and rubber-band thick tires, hoping to reduce lean and roll. This works great on cars with huge sticky tires and lots of downforce (and thus high speeds), and ideally, driven on perfectly smooth tracks. While many try to mimic this on a street car, it’s usually not the case. Normal roads, and even many racetracks around the country are anything but glass-smooth. We’re genernally not running slicks or even R compound tires when we drive to the local diner or for a weekend blast down some backroads, and while we may have installed them on our cars, we’re not generally using dive planes, functional splitters and spoilers to their potential due to street-legal speeds. The same car that handles on rails is also crashing over every imperfection out there. Expansion joints might as well be speedbumps, uneven pavement akin to driving over road spikes. Geometry aside, these super stiff setups often compromise road car handling, more than they improve it. Chassis stiffening is not the same as suspension stiffening, and this is an often-overlooked feature. The chassis of the car is like the skeleton of a high rise building. It’s made of steel girders, because it’s the backbone of the structure. Similarly a cars chassis is the skeleton of the car: it supports everything else. When NISMO developed the 350Z NISMO edition, mane shunned it as merely a cosmetic upgrade. The engine afterall was the same – but it wore a wildy out there (for a factory car) body kit – a long front bumper with low splitter, a long rear bumper overhang, and a decidedly “Fast and Furious” style spoiler. Delve deeper and you find what makes it so special. The chassis is fully seam welded. Meaning every joint, where 2 pieces of aluminum are bonded together, are full sealed. There are no gaps, there are no open joints. This increases chassis rigidity by a decidely large amount. This is one of the things people often do when bulding a race car from the ground up. To that chassis, Nissan fitted significantly stiffer springs (one of the stiffest out there on a road car) with heavy duty dampers. 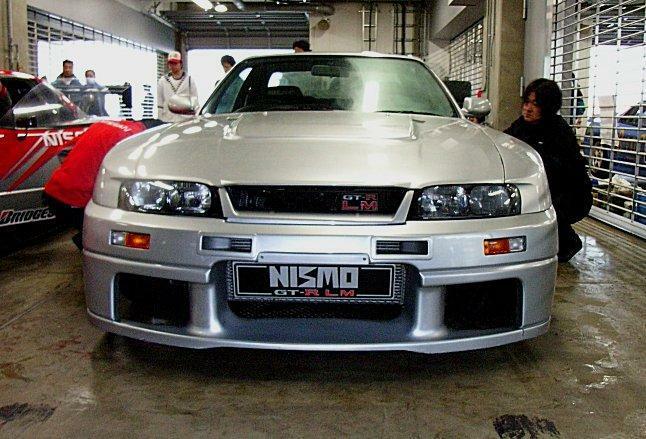 While the bushings and swaybars remained the same compared to other NISMO cars, the car was noticeably stiffer. But this is, afterall, a road car. While it is very much at home on weekend track days and club events, it’s designed to be a fun, sporting day to day means of transportation. Had it been left alone, it would have been panned for being too obnoxious on the road, too upset by the concrete jungle. To solve those issues NISMO worked with Yamaha to develop a Z-specific pair of body dampers. These attach fore and aft of the shock pointing points, between the 2 biggest “holes” in the chassis – at the front bumper, and in the rear spare tire well. Why there? When a suspension compresses and rebounds, energy is created, stored, and released in very quick succession. The stiffer the spring, the more aggressive the shock valving, the quicker this process happens. Which is why from inside the cabin, that uneven pavement can be downright punishing….whereas in a Toyota Camry, it’s just soaked up effortlessly. The dampers Yamaha and NISMO developed are designed to specifically combat these vibrations, without toning down the benefits that the spring/shock combo gives the handling aspect of the car. When you look at them out of the box, they are basically a strut brace, with a little shock built in. They compress and rebound, like a strut does. However they mount veritcally, whereas shocks mount horizontally. So they combat the natural vibrations the chassis will face when hitting potholes, uneven pavement, and normal bumps in the road. This minimizes energy losses, and lets the spring and shock more efficiently do their job, while keeping the driver comfortable, and thus confident, behind the wheel. Think it’s still just marketing hype? F1 cars began using similar devices in the 2006 season. Or, just try it for yourself: we have. A 350Z with coilovers (pick your poison, it even helps with wife-friendly coilovers such as Bilstein and KW). With the typical set of low profile 18 or 19 inch tires, and at the typical lowered stance these cars look so good at, it turns the car from a bit erratic over bumps, to downright stable. The suspension is now more able to work in unison, left and right, front to back, whereas without the dampers, it’s a bit of a free-for-all, with the driver being asked to control it all on the fly. It is truly eye-opening how these simple bolt on devices stabilize the vehicle. The neat thing about these, is they are available for several carswe get here in the US, including the Subaru WRX (02-07), 350Z/G35. Need one for your car? Just drop us a line! Starting Monday August 12 and continuing through Friday, August 16, all HKS items are on sale! 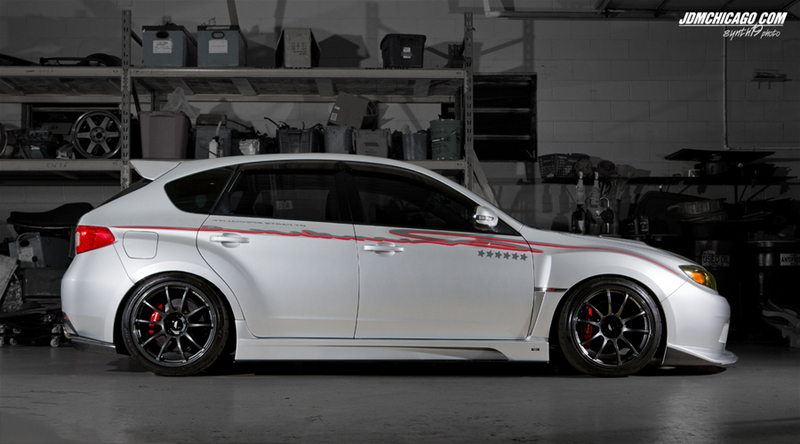 HKS is Japan’s premier manufacturer of performance parts for performance vehicles. Their parts are second to none because they race what they make. There are tons of items on sale, many more than we can just list here. Drop us a line at z1sales@z1auto.com with your HKS needs. 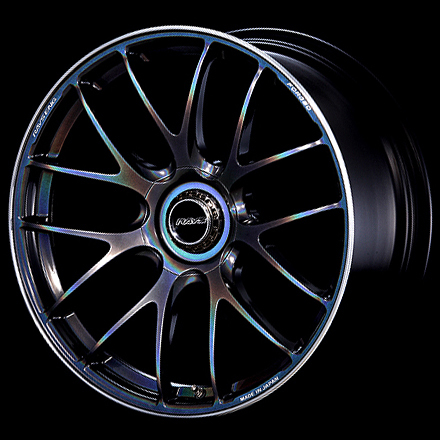 Volk has released a new wheel: the G27. This multispoke wheel comes in 19’s and 20 inch sizes for a range of vehicles. It’s features Volk’s legendary 1 piece forged construction, making it both durable and lightweight. It also features a new spin on center cap design for a nice clean look. Comes in Prism Dark silver (shown). Prism Light Silver or White are optional finishes. Contact z1sales@z1auto.com for price and availability. The T518Z based tuner turbo kit from Greddy is now available for preorder. Big gains from this simple kit: +93.5 whp / +68.7 ft/lbs increase at just 7 psi on a stock 2013 Scion FR-S with factory injectors and fuel pump (with an exhaust and ecu reflash). 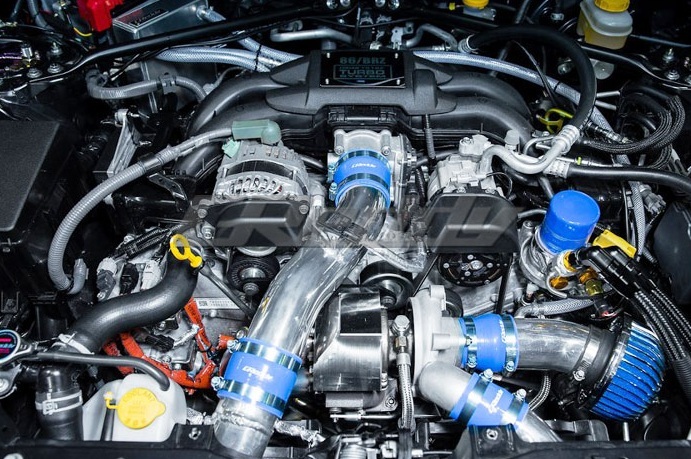 The kit includes the GReddy T518Z 10cm2 actuator turbo on an equal length 4-1 SUS header-type exhaust manifold with dual flex joints, SUS downpipe and cat-delete, free- flow Airinx AY-SB intake, short-routing intercooler piping, Type-40E front-mounted intercooler with cast end-tanks and all the necessary brackets, heat-shields, hoses, clamps, and gaskets. Contact z1sales@z1auto.com to reserve yours as quantities are very limited. 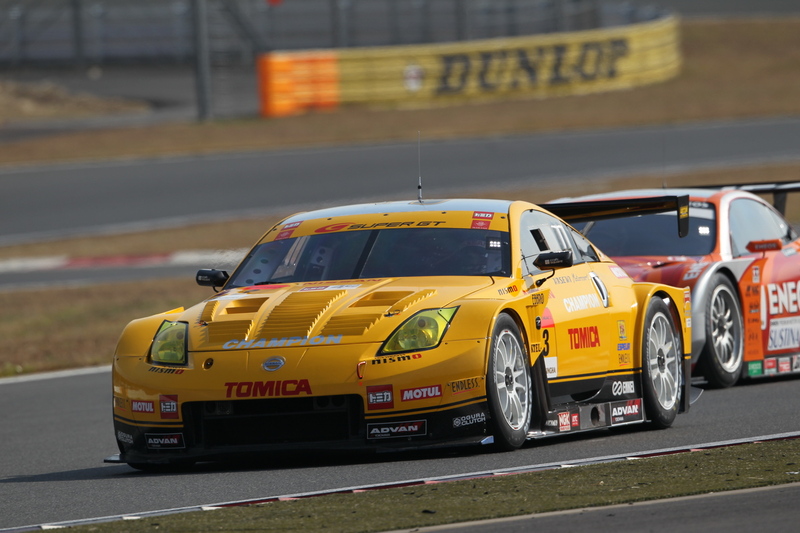 Prodrive Japan has some new stuff we thought you might like. From Seats, to Steering Wheels, the re-introduction of their Rapfix Quick Release and Lock, and Spline Drive lug set. All are special order only from Japan. The stuff is not cheap by any means, but Prodrive quality is second to none. When the Forester came out, it was a New England mom’s dream. Now they could join the Subaru party and ditch the Chrysler minivan they had to endure in the past. 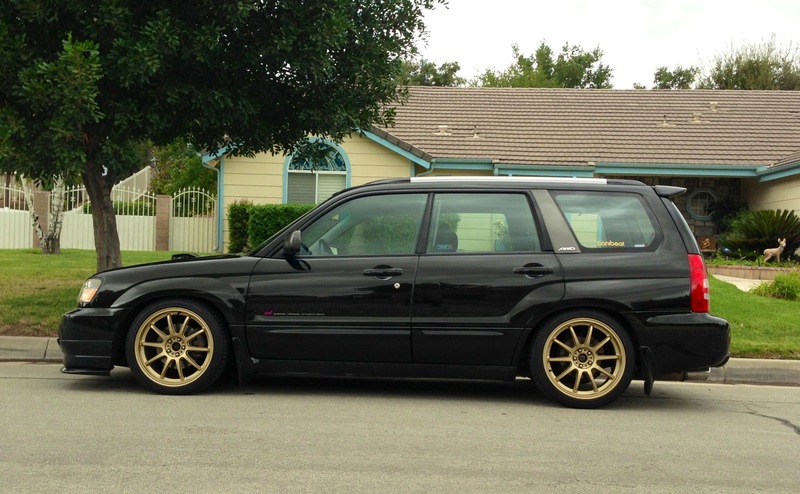 But let’s face it, the Forester wasn’t much of a looker. Then Subaru dropped in the Turbo 2.5 engine, and suddenly, some ears perked up. Now the car had a bit more of an edge. Some Hyde to go with the Jekyll. But the vehicle was largely lost in the wake of the WRX and STi. Of course we never got the cooler STi Foresters sold in Japan. As they say, necessity is the mother of invention. So for those who wanted to Zig rather than Zag, people have began taking these Foresters and doing some cool things with them. 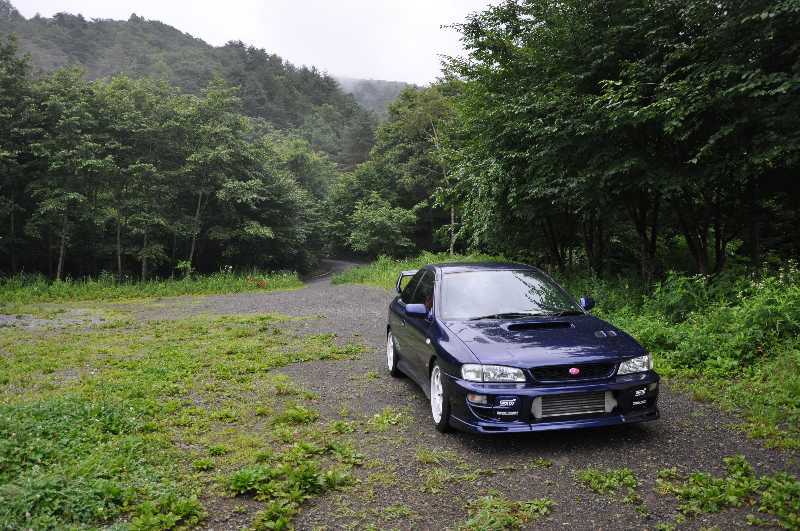 Subaru’s are the VW’s of Japan – virtually everything swaps into everything else more or less. While certainly not common to mod, this represents an awesome canvas for someone who wants a great platform to build on, has a budget in mind, and doesn’t want to go tearing into a brand new car. But, wants to maintain reliability, interior space, and the safety and performance benefits of AWD. The same Subaru from our previous post, in it’s natural Touge element. Being stationed in Japan opens up a lot of opportunities for a car guy. Suddenly all the cars you’ve lusted at over the years in magazines you couldn’t quite understand, are nearly at your disposal. The roads you’ve memorized from watching the Best Motoring Touge DVD’s 1001 times are within driving distance. And the parts….oh the parts! For a car guy, being able to serve your country, and do it in a country that is the foundation of everything that makes you go ga-ga car wise, would be quite a lot of fun. The guy who owns the car here is a car guy through and through. But his Subaru is what punches all the right numbers for me. Because it reminds me so much of my old RS. This car started life as a 2000 STi V6 Type R that when acquired, had a few mods. My own personal Subaru muse 🙂 The owner has steadily modified it over the years with tons of mods. 6 speed swap, EJ257 block (forged internals), AVCS equipped EJ207 heads (with Kelford cams), ATP 35R, big FMIC, coil on plug ignition, a full helping of STi Group N and Cusco bits, LINK programmable ecu (I had one of those too!). It’s quite a bit of kit as our friends on the other side of the pond would say. Fast forward a few years, and while out and about, the car is rear ended in a hit and run. What’s more, he’s now planning on headed back to the states later in 2012. So what is a car nut, totally in love with what he’s created in Japan, to do? The pics speak for themselves! He decided to totally strip it down, and take every nut and bolt, every covetted part, ship it back to the states (being military has it’s perks…the parts ship free! ), and start over. Same soul, different skin. The plan upon return is to insert everything into a USDM car. I see visions of the Bionic Man playing in my head “we can rebuild it, we have the technology”. Those of us who truly love our cars, believe they do have a soul. There is a connection you get when you plan it yourself, work on it yourself, that really brings you to another level with what was previously just a machine. When this car was built, I’n sure the current owner would not have though he would one day own it. And I am sure the soul of this car never could have contemplated it would leave it’s native Japan and get a chance to be reborn half a world away. Like 2 ships otherwise passing in the night, that just happened to stop and grab a cup of coffee together. The relationship with one’s car can truly be a “romance” if you will. The reason for posting this, aside from it being a sweet example of a Subaru is to try to convey how passionate some are about their cars. Sometimes your project takes a twist and turn you never would expect, but that’s not a reason to give up. Sit down with a beer or 3, reasses the situation, and formulate a plan. When you’ve worked so hard on something, poured so many countless nights into a project, not even a the distance from the mountains of Japan to the US can keep a project down. Will definitely be following the rebirth once it begins here in the states.